National Institutes of Health will support 17 research initiatives leading to development of microfluidic chips that simulate the structure and function of human organs. NIH’s National Center for Advancing Translational Sciences is funding the projects for five years at a total cost of $70 million. The project involves collaboration with the Defense Advanced Research Projects Agency and U.S. Food and Drug Administration. The chips are expected to speed safety and efficacy testing of drug candidates, providing an alternative to animal testing that can be time consuming and less reliable. 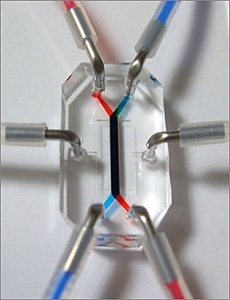 Tissue chips, as the devices are called, adopt techniques from the computer industry with tissue engineering to create miniature models of living organ tissues on a hand-held transparent microchip. The chips are lined with living cells and contain features designed to replicate the complex biological functions of specific organs, such as heart, lung, and intestine (pictured left). NIH says more than 30 percent of promising medications have failed when found to be toxic in human clinical trials, despite promising preclinical studies that test the compounds on animals. Tissue chips, which are a newer human cell-based approach, may help researchers better predict how effective a therapeutic candidate would be in clinical studies. Ten of the 17 awards will support research on cellular microsystems that represent a number of human organs, and that lead to the development of individual microchips. The bio-engineered devices are expected to be functionally relevant and reflect the complexity of the tissue of origin, including genomic diversity, disease complexity, and pharmacological response. The other seven awards will explore the potential of stem and precursor cells that differentiate into multiple cell types representing the cellular architecture in organ systems. These stem and precursor cells could act as a source of tissue cells to populate the devices. The following video from the Wyss Institute for Biologically Inspired Engineering at Harvard University, one of the grant recipients, tells more about tissue chips.